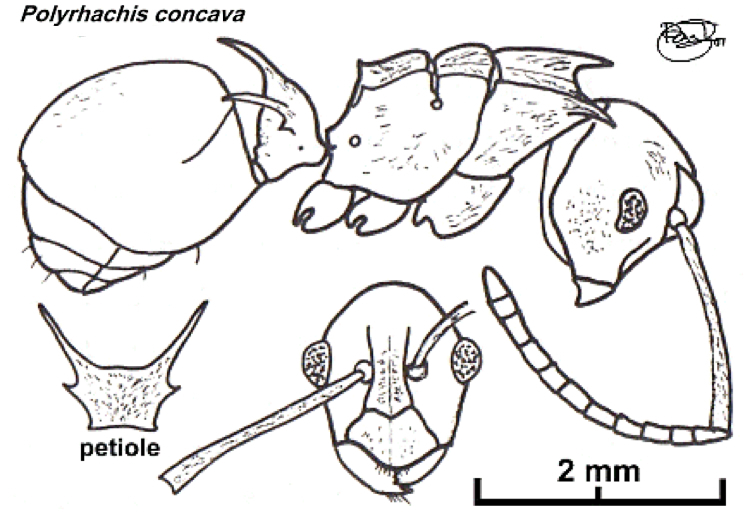 Bolton (1973b: 299, illustrated, full-face view, alitrunk profile, anterior petiole); see Bolton, 1995) . Erect hairs only on the anterior clypeal margin and apex of the gaster. Pubescence yellowish to pale golden, densest on the alitrunk. The side view of the eye is unique in that the ventral margin is raised and extended giving the eye a reniform (kidney-shaped) outline. Anterior margin of clypeus arcuate and entire. Dorsum of alitrunk transversely concave especially the propodeum. Alitrunk marginate throughout its length, interrupted only at the sutures, the marginations projecting and flange-like. Pronotum with a pair of spines and the propodeum with a pair of, usually small, upcurved teeth. Anterior face of first gastral segment vertical and not convex in the middle. Collected by me from shrub vegetation at the Cocoa Research Institute of Nigeria, Idi Ayunre; the first Nigerian record. IVORY COAST: Abidjan, 17.vi.1958 (E.S. Ross & R.E. Leech) (1 g, 1 w, CAS). EQUAT. GUINEA: Fernando Poo [currently Bioko], Punta Frailes, x–xi.1901 (L. Fea) (1 w, MSNG). Y70); P.N. Dzanga–Ndoki, 38.6 km 173° S Lidjombo, 2°21.60’N 16°03.20’E, 350 m, 22.v.2001 (S. van Noort) (5 w, CAS: CASENT0092209 CAR01-S201, CASENT0092238 CAR01-S203, CASENT0092328 CAR01-S210, CASENT0092336 CAR01-S211, CASENT0092571 CAR01-S229); P.N. Dzanga–Ndoki, 38.6 km 173° S Lidjombo, 2°21.60’N 16°03.20’E, 350 m, 22–23.v.2001 (S. van Noort) (1 w, CAS: CASENT0086392 CAR01-M187). The photomontage of a cotype worker is collated from http://www.antweb.org/specimen.do?name=0910903. 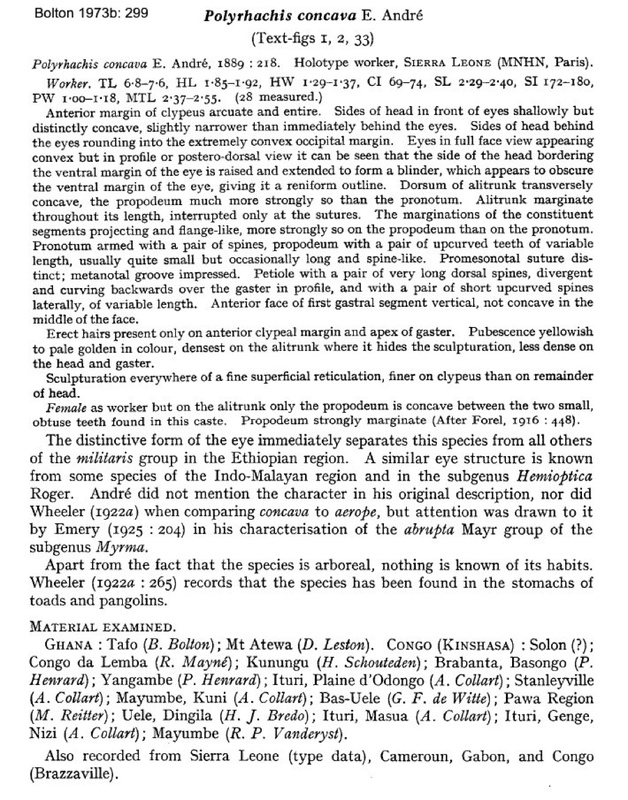 Wheeler (1922) listed findings from Cameroun (by H. Brauns, at Mundame by Conradt, at Bibundi by Tessmann, and at Yaoundé by Zenker); also others from Congo and Zaïre. Forel (1911f) found specimens in the Congo Museum from Zaïre, Congo da Lemba, by Mayné. Other collections from Ghana, at CRIG (B. Bolton), and Atewa Forest Reserve (D. Leston); Cameroun (no details); Gabon, Zaïre and Congo (Bolton, 1973b). Bernard (1952, not referred to by Bolton, 1973b) described it as a slender ant, rare in collections, known from Sierra Leone, Cameroun and Congo. 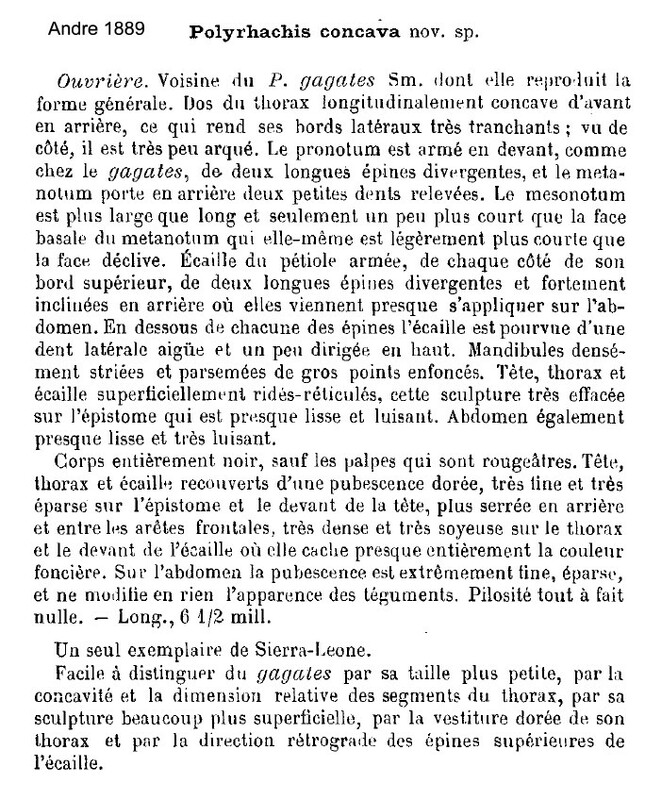 In Guinea it was found at Nion (1 worker), Kéoulenta (2 workers), Camp IV, 1000 m (5 workers); specimens with a golden pubescence on the thorax. The photomontage is of a (somewhat dirty) specimen from Gabon, Pongara NP, edge of savannah, 8.viii.2006, collected by Yves Braet (Gabon 98). The photomontage is of worker from Benin; Collection details: Forêt de Gnanhouizoumè; 06°55’03.7 N 02°24’44.6 E); 29.i.2007; Forêt fourmis (forest ants); collector S Tchibozo. The photomontage is of a queen from the Central African Republic, Dzanga-Sangha Nature Reserve; collector Philippe Annoyer (CAR KK). The photomontage is of a male from the Central African Republic, Dzanga-Sangha Nature Reserve, collector Philippe Annoyer (CAR HS).